5.7.12: transactions: 4689 (93.71 per sec.) — That is a 37.36% decrease! Note: on high-end systems with premium IO (think Fusion-IO, memory-only, high-end SSD with good caching throughput), the difference would be much smaller or negligible. The culprit is thus the --sync_binlog=1 change which was made in 5.7.7 (in 5.6 it is 0 by default). While this may indeed be “the safest choice,” one has to wonder why Oracle chose to implement this default change in 5.7.7. After all, there are many other options which aid crash safety. This seems incorrect given our findings, unless perhaps it requires tuning some other option. This raises some actions points/questions for Oracle’s team: why change this now? Was 5.6 never crash-safe in terms of binary logging? How about other options that aid crash safety? Is anything [before 5.7.7] really ACID compliant by default? Note: the increase here is to some extent negated by the fact that enabling sync_binlog is overall still causes a significant (30% on 5.7 and 48% on 5.6) performance drop. Also interesting is that this could be the effect of “tuning the defaults” of/in 5.7, and it also makes one think about the possibility o further defaults tuning/optimization in this area. This raises another question for Oracle’s team: with four threads, there is a ~11% decrease in performance for 5.7.12 versus 5.6.30 (both vanilla)? The findings in this article were compiled from a group effort. I’d argue that sync_binlogs isn’t needed for the technical definition of ACID. Seems a bit misleading to suggest 5.7.x is slower than 5.6.x since comparing sync_binlog=0 is not an apple to apple comparison of sync_binlog=1. 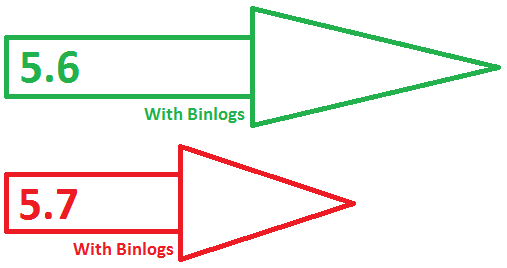 Granted when both versions use sync_binlog configuration defaults it is slower, but the point is even with 5.6 by itself, 5.6.x is slower when sync_binlog=1 because it waits for the OS to push to disk. More importantly the discussion should highlight that yes systems are at risk when sync_binlog=0 and the database crashes from an OOM. All data in flight not persisted to disk will be lost, and often corrupts the database to such extent it is not repairable. Therefore a system should always default to safe values and let the administrator choose when to be at risk for performance reasons. This reminds me of relational databases back in the 1980’s where IBM’s Database 2 (DB2) defaulted to some of the worst locking configurations(isolation level and timeout) and it required a knowledgeable consultant to know the default values were bad. I think the title for this blog post is misleading. 5.7 tests ran with sync_binlog=1, 5.6 ran with sync_binlog=0. You ran a test with different configurations. I do that all the time. I prefer that the default not get changed in the middle of the 5.7 lifecycle, but that needs a different title. @Scott & @Mark – In regards the (now removed) title “Binary logs make MySQL 5.7 slower than 5.6” – yes! It looks like our blog team edited the original. I have restored my original title (“MySQL 5.7 By Default 1/3rd Slower Than 5.6 When Using Binary Logs”) and introduction! Thank you for the heads up! It would be interesting to see the results with Performance Schema turned off. A quick investigation shows a 15% increase in the number of instruments enabled by default between 5.6 and 5.7. @Roel great analysis and your blog post and I think the title of the article was spot on, we were in an emergency situation and had to clone a MySQL slave server and had no choice but to throw an 5.7 box into production. We saw the IO usage rise significantly but IO throughput remain low totally unexpected and not something we had seen with other 5.7 production servers. Thanks for this great post. We just upgraded from 5.6 to 5.7 and have been scratching our heads trying to figure out why its slower. But why you leave default settings for file sync variables. Would this be better if such important variables are hardcoded and not picked as default. Hi Mannoj. Not sure I am following your reply. Please note that this is in the (what is upstream for us) MySQL server. It also makes sense to be able to configure these variables on/off for different configurations. Let me know if I missed anything. Thank you for writing this article, we didn’t know what was making the writes so slow in our system! In our case it was not 1/3x slower, but 1300x slower!!! great post, thanks for this article.